I love sweet potatoes and am always looking for some new way to prepare them. This one is super easy, and very holiday-ish. Give it a try! 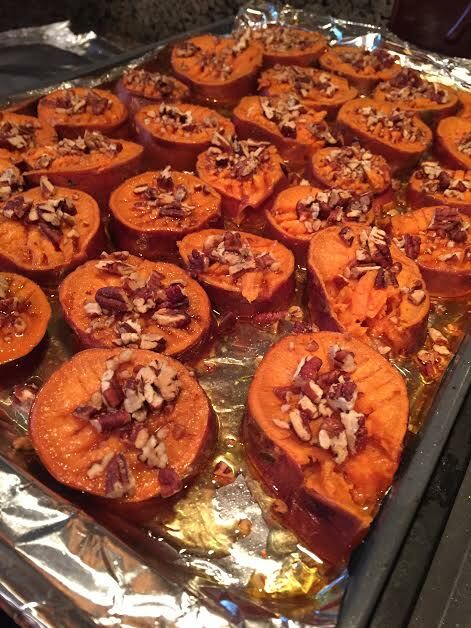 Slice the sweet potatoes about 1/2-3/4″ and place them on a baking sheet. Drizzle with olive oil. Roast them for about 40 minutes in a 375 oven, or until they start to soften when touched with a fork. Meanwhile, add the apple juice and whiskey to a small sauce pan and simmer until reduced to about 1/2 cup. When the sweet potatoes are done, smash them slightly with a fork. Brush with the glaze, sprinkle the toasted pecans on them and put them back in the oven for another 20 minutes. Enjoy!! !